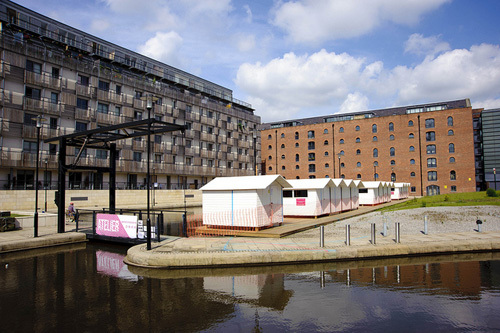 I really enjoyed having a mooch around Piccadilly Basin this afternoon with Alex from Piccadilly Partnership, and checking out the fab things that are happening right now, right on Curve’s doorstep! LomoWall on Tariff Street adds a burst of colour to the urban landscape with a 30m space covered in photos of Manchester submitted from around the world. The overall effect is to create a striking image which reflects the city skyline. 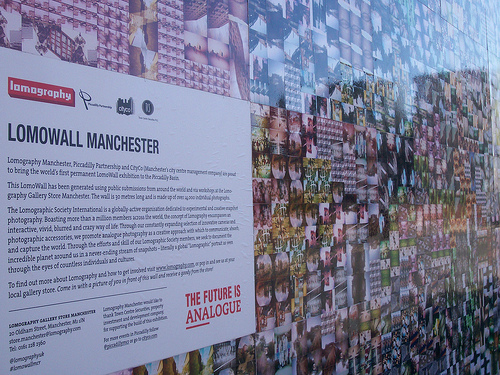 This is the first permanent LomoWall exhibition in the UK and celebrates Lomography’s 20th birthday. Across the road in the canal basin, Atelier(Zero) has been created to celebrate the London Olympic Games’ Cultural Olympiad. Canal-side chalets on the tow path house relaxation and play areas and you can even take a rowing boat out on the canal. The perfect summer’s afternoon activity now it’s the school holidays! Designed and built by 28 students in a unique collaboration between Manchester School of Architecture and the École Spéciale d’Architecture in Paris, the project is curated by independent creative director, Jane Anderson, and directed by Karsten Huneck and Bernd Truempler of Office for Subversive Architecture and funded by the Arts Council. The chalets are available for artists and musicians to adopt free of charge during the project. The area is also marked out with Olympic sports’ pitches including a very cool community swing ball. During the coming weeks the area will see the arrival of the Canal Festival, including loads of family friendly activities and even a ‘float in’ (or drive in) movie!! Curve are very excited to have all this going on outside our window and you can be sure to find us down by the canal this summer.